Our private server will be accessible from all devices on the office network (192.168.1.0/24) by connecting the office Cisco ASA to Binary Lane VPC. 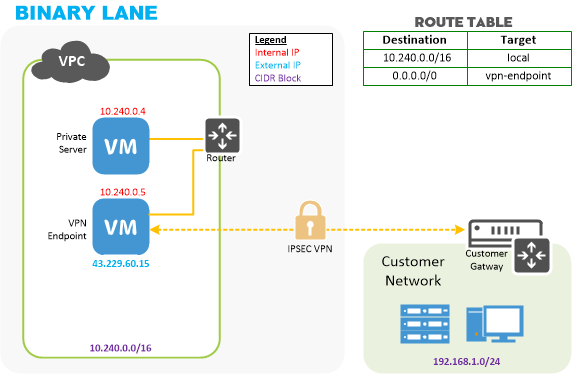 In this example we are extending an existing VPC by adding site-to-site VPN connectivity to it. The existing VPC consists of a private database server. Create a new Ubuntu 14.04 server, the VPN end point, as a member of the existing VPC. Note that db.example does not have a public IP address. To let our web server provide NAT functionality, Source/Dest Check must be disabled. Click the "Enabled" link and disable the check. Enter a new route with destination set to 0.0.0.0/0, and the target as the internal IP of the VPN server. Click "Save and Apply" to update the VPC configuration. Pre-Shared Key: This is a passphrase, that you will configure on both the remote (Binary Lane) and local (Cisco ASA) end. The deployment script will also set up your VPN server to provide outgoing NAT, allowing your private servers to fetch software updates from the internet. Select site-to-site VPN on the "outside" tunnel interface, and click Next. For Peer IP Address enter the VPN server's external IP, select pre-shared key and enter the same passphrase you configured earlier. Click Next. The Encryption method should be set to AES-192, Authentication to SHA and Diffie-Hellman Group to 2. Click Next. Similar to step 3, set Encryption to AES-192, Authentication to SHA, enable Perfect Forwarding Secrecy and set Diffie-Hellman Group to 2. Click Next. The Local Networks should be set to your office IP range, e.g. 192.168.1.0/24 ; while Remote Networks should be the VPC IP range which defaults to 10.240.0.0/16 . Exempt ASA side/host network from address translation should be enabled as we do not require NAT. Click Next. On the last step, review the configuration and make sure it is correct; then click Finish. At this point the VPN will be ready for use. You can test the VPN by using one of the office computers (on the 192.168.0.0/24 range) to try and ping the private VPC server (10.240.0.29 in this example; will be different for your own setup). If everything is working correctly, you will get a ping reply and can now utilise bidirectional connectivity between your office and Binary Lane VPC.